Arctic sea ice extent fell 0.16 million km² from November 16 to November 19, 2016, as illustrated by above ads.nipr.ac.jp/vishop image. The image below, based on NSIDC data, shows the Arctic sea ice shrinking 49,000 km² in four days. This is happening at a time when there is little or no sunlight reaching the Arctic, as illustrated by the image below. 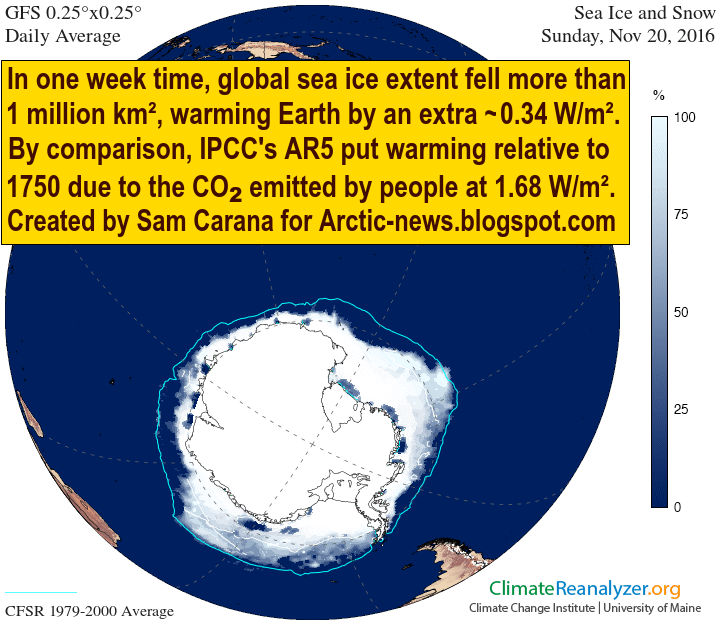 The image below was created by Torstein Viddal and earlier posted at the Arctic Sea Ice Collapse blog. 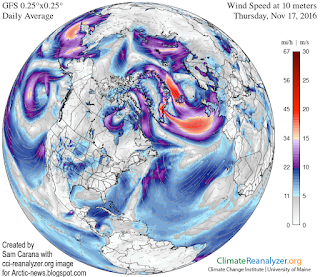 This recent fall in extent is partly due to strong winds, as illustrated by the image on the right. Mostly, though, the lack of sea ice over the Arctic Ocean is caused by very warm water that is now arriving in the Arctic Ocean. During the northern summer, water off the coast of North America warms up and gets pushed by the Coriolis force toward the Arctic Ocean. It takes several months for the water to travel along the Gulf Stream through the North Atlantic. It has taken until now for the Arctic Ocean to bear the brunt of this heat. As the image below shows, record sea surface anomalies showed up near Svalbard on October 31, 2016, when this heat first arrived in the Arctic. 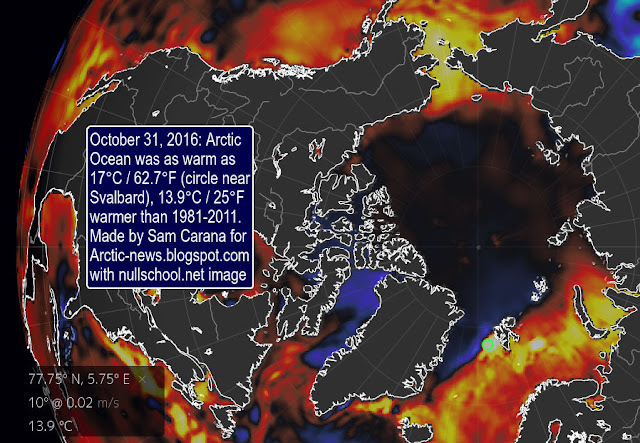 On October 31, 2016, the Arctic Ocean was as warm as 17°C or 62.7°F (green circle near Svalbard), or 13.9°C or 25°F warmer than 1981-2011. This indicates how much warmer the water is beneath the surface, as it arrives in the Arctic Ocean from the Atlantic Ocean. Moreover, Antarctic sea ice is also falling, reflecting the warming of oceans globally. 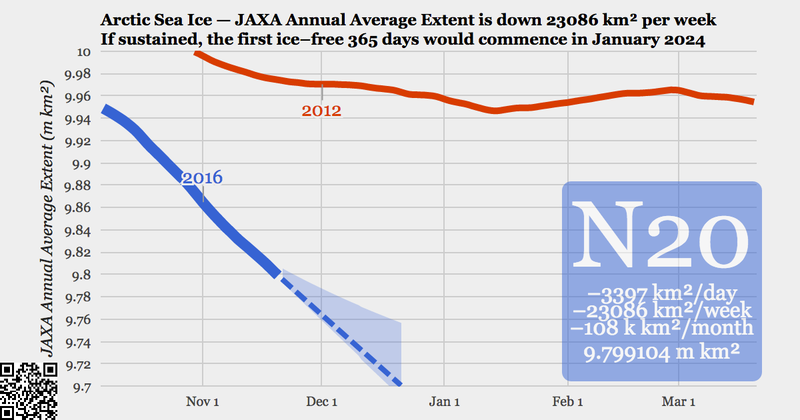 For some time now, Antarctic sea ice extent has been at a record low for the time of the year. On November 19, 2016, the combined extent of Arctic and Antarctic sea ice was 22.423 million km², as the image below shows. 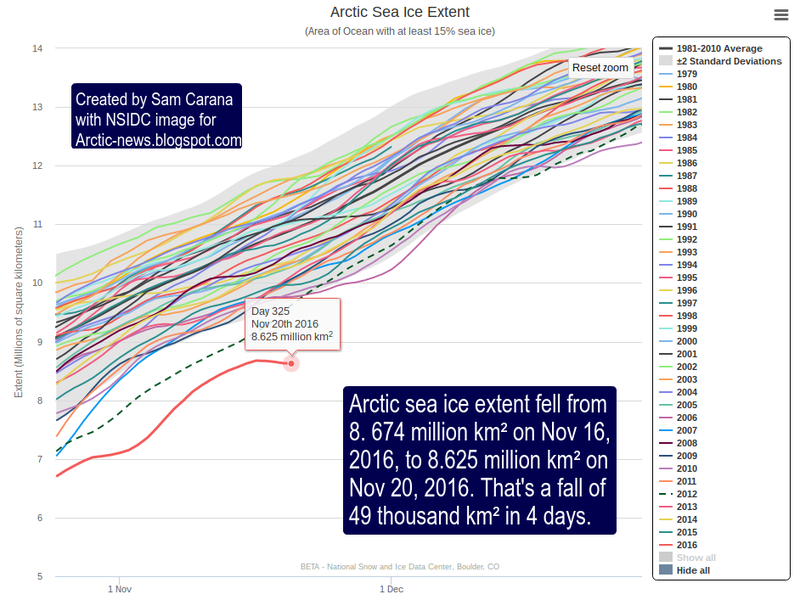 This constitutes a fall in global sea ice extent of 1.085 million km² (418,900 square miles) since November 12, 2016, when global sea ice extent was 23.508 million km². Let's look at those figures again. On Saturday November 12, 2016, global sea ice extent was 23.508 million km². On Saturday November 19, 2016, global sea ice extent was 22.423 million km². That's a fall of more than one million km² in one week. By comparison, that's more than the combined size of ten European nations (such as Switzerland, Austria, Hungary, Germany, Denmark, the Netherlands, Belgium, Luxembourg, the United Kingdom and Ireland). Or, it's more than the combined size of seventeen States of the United States (such as Ohio, Virginia, Tennessee, Kentucky, Indiana, Maine, South Carolina, West Virginia, Maryland, Hawaii, Massachusetts, Vermont, New Hampshire, New Jersey, Connecticut, Delaware and Rhode Island). How much additional energy does Earth retain, due to such an albedo change? If it was a total albedo flip, it would be some 0.68 W/m². 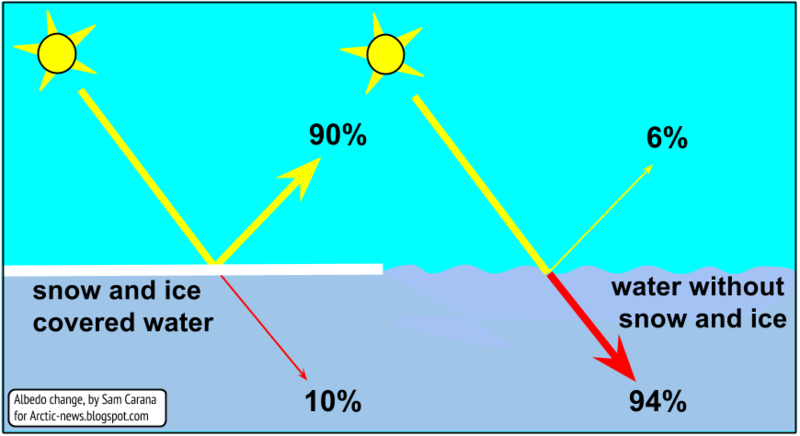 A conservative estimate would be a 50% albedo flip, as the image below illustrates, so this would mean that Earth now retains some 0.34 W/m² extra energy. So, this one-week fall in sea ice extent means there now is an additional warming of some 0.34 W/m². By comparison, the warming impact relative to the year 1750 of all carbon dioxide emitted by people was 1.68 W/m² in the most recent IPCC assessment report (AR5). There's more! As sea ice declines, there is not only albedo loss due to a fall in extent, but there is also albedo loss over the remaining sea ice, which turns darker as it melts. 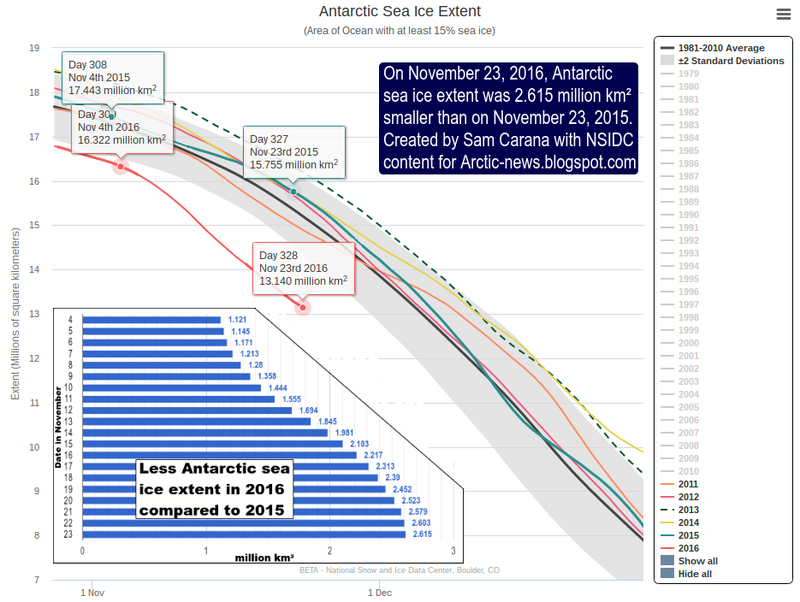 The image below shows the fall in extent of Antarctic sea ice up to November 20, 2016. On November 20, 2016, Antarctic sea ice extent was 2.523 million km² less than its extent was at the same time of the year in 2015. How much more energy is now retained by Earth than in 2015? Assuming a 50% albedo flip for this extent loss and a similar albedo loss that's taking place over the remaining ice, this means that Earth is now retaining an extra amount of energy (compared to 2015) that is equal to all the warming relative to pre-industrial due to carbon dioxide emitted by people. Above image shows how the difference between 2016 and 2015 Antarctic sea ice extent grew between November 4 and November 23. On November 23, 2016, Antarctic sea ice extent was 2.615 million km² smaller than on November 23, 2015. That means that a huge amount of sunlight is now absorbed by the ocean, rather than reflected back into space. The animation on the right (added later) shows the decline of the sea ice around Antarctica over the period from November 16, 2016, to January 4, 2017. For comparison, the blue line shows the 1979-2000 average. What does this warming of 0.68 W/m² mean? Do you mean that we now can expect almost half of the warming we already done more in the future because of this? Here's another way of saying it. If that one-week loss in extent was a total albedo flip, it would be some 0.68 W/m². A conservative estimate would be a 50% albedo flip, so this would mean that Earth now retains some 0.34 W/m² extra energy. By comparison, that extra amount of 0.34 W/m² RF is as much as 20% of the added RF (relative to 1750) that the IPCC in AR5 said was caused by all carbon dioxide emitted by people. Here's another calculation. On November 20, 2016, Antarctic sea ice extent was 2.523 million km² less than it was at the same time of the year in 2015. Assuming a 50% albedo flip for this extent loss and a similar albedo loss that's taking place over the remaining ice, this means that Earth is now retaining an extra amount of energy (compared to 2015) that is equal to all the warming relative to pre-industrial due to carbon dioxide emitted by people. Presumably, this 'albedo flip warming' will be instantanoeus (as soon as the sun rises) as opposed to carbon dioxide emission warming, which has a time lag of 10-40 years for maximum effect? Yes exactly, it is pretty instantaneous. As long as there is ice in the water, the temperature of the water will remain at around freezing point. 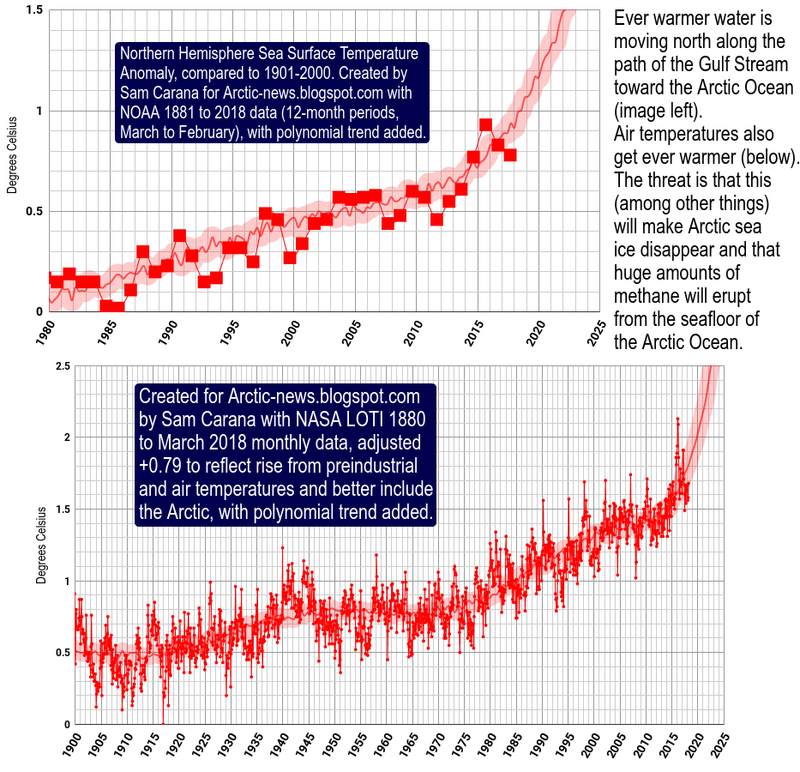 As sea ice decline progresses though, there is a tipping point beyond which there is not enough sea ice left to act as a buffer and consume the heat. 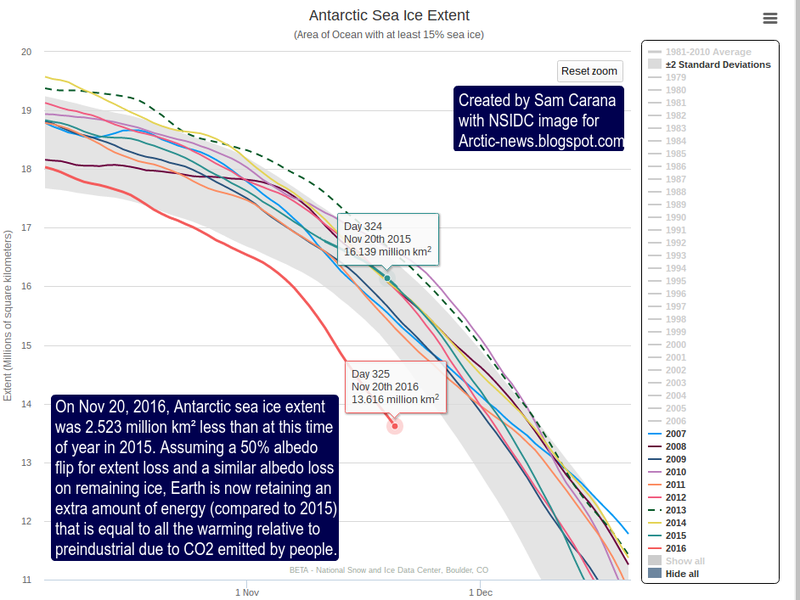 So, sea ice can disappear rather abruptly, resulting in a pretty much instantaneous temperature rise. So, if Sam's calculations are correct, would it be unreasonable to postulate (in the absence of any other mitigating factors) a rise in global average temperatures over the next year on a similar scale to what we have witnessed post 1750? I know you weren't talking to me, but I know Sam is busy. According to NASA, a loss of 1% in global albedo is equivalent to doubling the CO2 concentrations from 280 to 560ppm, which equals to roughly 3°C global average warming; but that doesn't take into account the other 60'ish self reinforcing feedback loops in the climate system like methane and the dying of trees for example. The Nasa numbers you got a link? 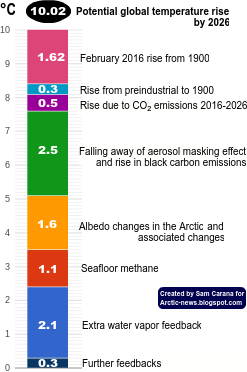 * Artic annual albedo 48% is that sea ice? * 10 miljoner km2 is annual average surface of artic sea ice witch would be about 2% of the earths surface. * In that case the artic sea ice is responible for 2%*48/30=3,2% of the global albedo. Sunday, I went out for a walk with a good friend of mine. The smell of ozone was very strong (I never smelled it this strong); the air was very still and a severe cloud cover laid over the area for a few days, as it still does. I looked at ozone concentration maps : https://airnow.gov/index.cfm?action=airnow.canada but nothing is showing up for my area in central Quebec, so I wonder... It really smelled a lot, gave me sort of a cold as it can cause runny nose and my nostrils are still irritated. Anywhere else I could find ozone readings? I know they have the Aura satellite that presumably monitors Ozone but I can't find it's maps. I believe that ozone I smelled comes from the numerous wood burning stoves in my area could that be? Well now I see that you update almost every week. Sorry about that. I tried to find the ecvation for sun warming in sience papers. And I found it. 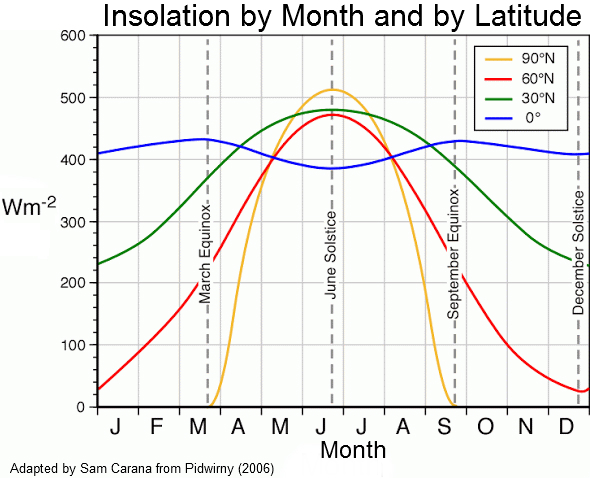 But how much sun radiation is hitting the artic sea ice in one year average. And is it the same every year. And offcourse is there any calculations how that will effect global temp, just by itself, when its gone. Thanks for your work from Sweden so my english may be flawed.